Coat slow cooker with cooking spray or butter. Place oats, almond milk, water, and almond extract in slow cooker, cover, and cook on low heat for 8 hours. 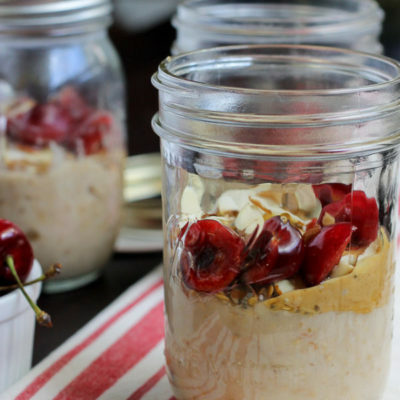 Spoon warm oatmeal into 4 mason jars or bowls. Top with a spoonful of almond butter, chia seeds, golden flax seeds, sliced almonds, and sliced cherries. WARNING: Please don’t forget to coat the slow cooker with cooking spray! I’ve forgotten this little move one too many times and I’ve ended up with a sticky mess in the morning!